How many times have set a weight-loss goal? That you are finally going to use your costly gym membership? Vowed that “this time” things will be different? You want to lose weight and get fit, but you cannot seem to follow through. The fact is – you can’t stay motivated. Actually, we all have difficulty keeping commitments to ourselves. …you have someone there paying you along the way? Could you manage to lose weight for potentially thousands of dollars? Well, as it turns out, losing weight and making money go hand-in-hand. There are numerous academic studies out there that have proven that statement. Bottom line: financial incentives are a useful tool for weight loss. …we were very skeptical, to say the least. The company is HealthyWage, and they pay YOU to lose weight. Are they real? Are they a scam? Are they insane? 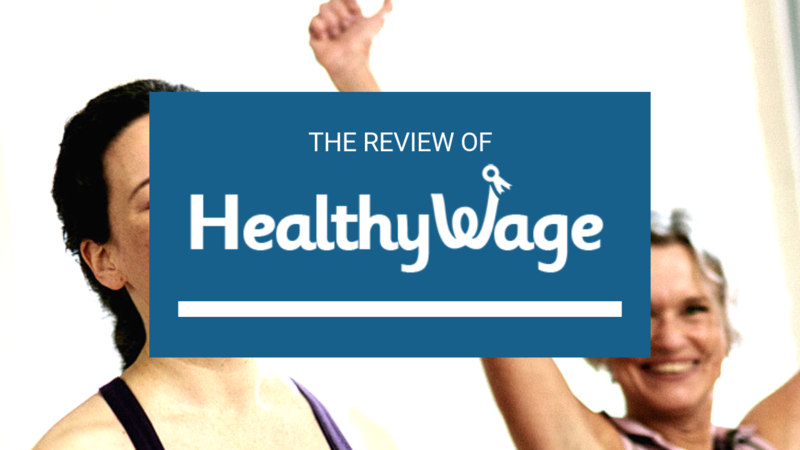 You are about to find out all of that and more in our review of HealthyWage. 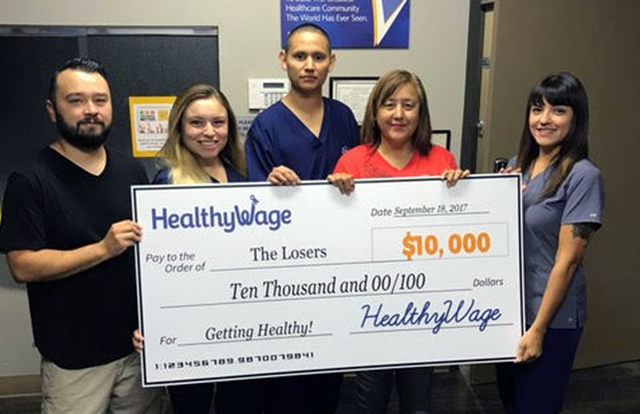 Founded in 2009, HealthyWage has created an innovative system to facilitate weight loss and combat obesity. The company uses cash prizes to make weight loss and fitness more fun and productive. The HealthyWager tool allows you to place a bet on your own weight loss – for prizes up to $10,000! To put it simply: you make a “bet,” but you are in control of the result. Small cash rewards can increase the effectiveness of weight loss programs. Social networks play a LARGE role in the spread of obesity and will likely play a significant role in reversing obesity. 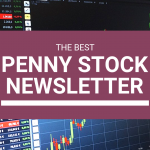 It is quite simple – MONEY MOTIVATES! …it is time to put these results out into the real world. How does it work? Is it effective? How do I sign-up?! …it is time to figure out how it works. Calculate Your Prize. 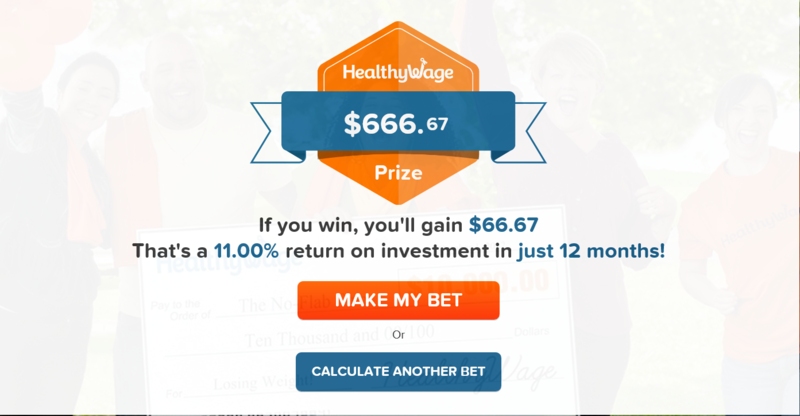 Use the HealthyWage calculator to enter your goal and calculate your winnings. Make Your Bet. Increase your winnings by adjusting your goal weight, how much you contribute, and the time you expect it to take. You can find a prize you like and make your wager. Lose the Weight. Stay on track throughout the contest with weekly weigh-ins and support from other contestants. Win Money! Meet your goal and win your prize. No strings attached! HealthyWage offers several different challenges that you can choose. Remember: you can sign up for up to 10 challenges at once! HealthyWager Individual Weight Loss Bet. 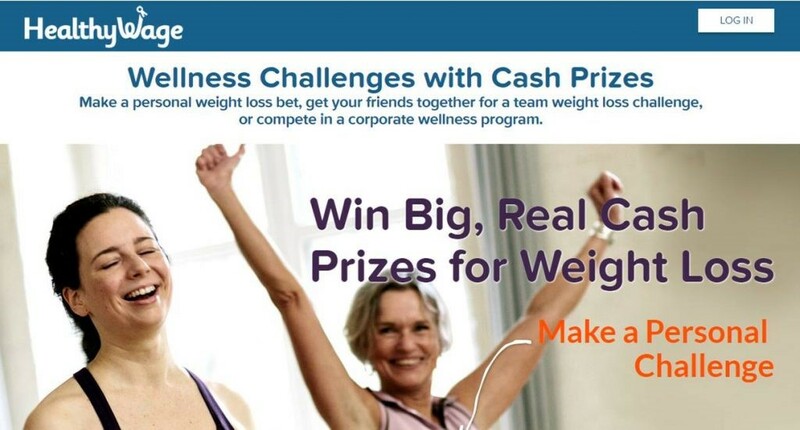 You can create a personal weight loss challenge with a cash prize for reaching your goal. Step Challenge. All users’ registration fees get put into one pot. You connect your step-tracking device, and the company creates a personalized goal based on your recent step activity. Meet your goal and win your share of the pot. $10,000 Team Weight Loss Challenge. The team that loses the highest percentage of weight can earn up to $10,000. Personal Jackpot Weight Loss Challenge. All user’s registration fees get put into one pot. If you lose 6% of your body weight by the end of the challenge, you win your share of the pot. Team Jackpot Weight Loss Challenge. Everyone puts money into the pot. Any team that has achieved an average of 6% weight loss splits the total pot. There are also corporate challenges that empower employees to become excited about weight loss. As mentioned above, you join up to 10 challenges. Doing so allows users to maximize their earnings during the same period of weight loss. Many users wonder how HealthyWage relates to taxes and how to report your winnings. 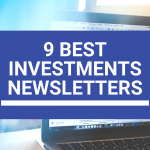 The IRS has a $600 threshold for reports, and the company will not collect your tax information if your winnings are less than $600 in one year. If you earn over $600 (which is very possible), you will need to report your winnings and pay taxes on them. We want to highlight two users’ (but there are many) success stories so that you can see firsthand how it all works. These users leveraged the fun, motivation, and accountability to reach their weight loss goals! 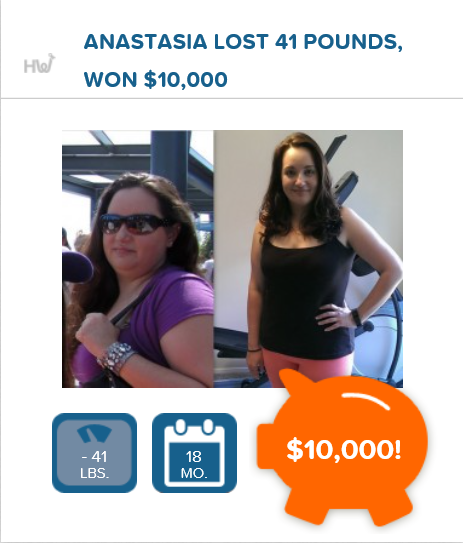 Before HealthyWage, Anastasia was miserable. …Anastasia decided to bet the maximum amount that she could afford! This strategy meant betting more money than she could afford to lose! She decided to wager $167 per month for 18 months – the amount she spent dining out each month. And without the extra cash around, she was prepared to start LOSING WEIGHT! …she found herself 41 pounds lighter and $10,000 richer! Blake recalls that “I started a diet every single morning…” for over 15 years before switching to HealthyWage. 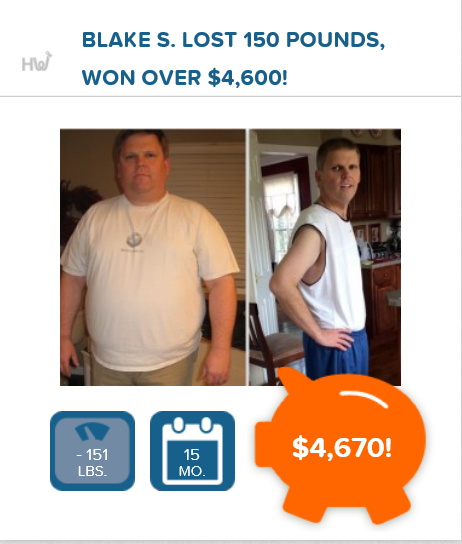 Blake decided to wager $150 per month for 15 months to lose 150 pounds! For some additional accountability, Blake decided to try the $10,000 Team Challenge. The team challenge helped keep Blake on track and pocket an extra $600 when his team took 3rd place. We can all relate to that, right? I decided to bet on losing 10% of my body weight over 12 months. My offered bet was set at $50 per month for 12 months to win $66.67. My “total win” would be $666.67 – but $600 of that is my own money. Ultimately, risking $600 to win $66.67 seems risky, but it is for a good [personal] cause. The more difficult the goal (i.e., higher weight loss), the more money that you stand to earn. You can enter your own numbers and calculate your HealthyWage offer. The quote is free, but you will need to enter your e-mail address. Every month, I see a $50 charge on my credit card from HealthyWage. After signing up, I received a two-week window for the final weigh-in. I set up numerous reminders to ensure that I weighed in on time. But I completed my initial weigh-in by the third day of the window. I had to take a “before photo” and will need to take an “after photo” to include with my results. I also had to upload a scanned copy of my driver’s license for additional verification. Will I reach my weight loss goal and earn the $66.67? …there are just a few caveats for those looking to start their own weight loss journey. Also, the weight loss should be below or equal to the weight loss planned initially. and most of Europe and Asia. The website is straightforward and easy to use. You can join challenges, view success stories, and interact with the HealthyWage community. HealthyWage also offers its own mobile app that is compatible with iOS and Android software. You can view your weight loss results, including how you rank amongst peers and friends, from anywhere. If adjustments need to be made, you will receive in-depth details that show precisely what you need to do for the upcoming week. The company received an A+ rating with the Better Business Bureau. HealthyWage is also financially supported by insurers, health systems and hospitals, food companies, and the government. Government and corporate leaders are aware that incentives work and are a cost-effective solution to battling obesity. HealthyWage has been featured in CNN, Fox News, ABC, NBC, The Doctors, TIME, and more. So, how can this company afford to pay people to lose weight? Apart from the financial backers mentioned above, we cannot forget – not everyone wins their bet! HealthyWage gets to keep the monthly wager set at the beginning of each failed challenge. …you will get paid if you meet your weight loss goals. Determine your prize amount using the HealthyWage Prize Calculator. How long you need to reach your goal (6 to 18 months). You can play with the number until you find a prize that you are good with (up to $10,000!). Sign up for an account to place your bet. From there, you can see your prize amount and are almost ready to get started! Once at the end of your wager period. You can verify your weight by taking a video at home and uploading to the HealthyWage website. Your weight loss timer does not start until you have verified your weight with HealthyWage. You can get your weight verified at your health club, doctor, or Weight Watchers meeting. Don’t belong to a health club or Weight Watchers? You can arrange a visit at one of HealthyWage’s health club partners. The weigh-ins are free and do not require that you become of member of the club. If you reach your weight loss goal, HealthyWage will pay you in cash. If you fail to reach your goal, your monthly contributions will go toward HealthyWage and future winners. Check by mail. 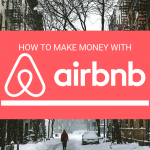 This method takes 3-4 weeks to process with no fee. This option is faster but has a 3% fee associated. You can contact HealthyWage with questions and comments on things like the company, weight loss challenges, diet bets, and more! You can also see a comprehensive list of FAQs here. Great incentive. The potential to win, and lose, money is a powerful one. If you have had difficulty losing weight in the past, HealthyWage is definitely worth a look. Social support. Features like competition and teamwork in the program provide the encouragement and social support necessary to make your weight loss journey a successful one. Set your own targets. You can set your own weight loss goal in a time frame that you believe is a reasonable one. Multiple challenges. You can participate in up to 10 challenges at any given time. Multiple challenges can enable you to maximize your earnings for the same weight loss. Deceptive marketing. I was not a huge fan of the “win up to $10,000” marketing. The majority of those winnings will be what you paid in to the program, with some additional earnings. Potential for loss. If you do not meet your weight loss goal, you lose your money. Period. No refunds, cancellations, or any other form of backing out. In all fairness, the program would be far less effective if you only stood to gain money. Are you determined to lose weight? Have you had trouble losing weight in the past? HealthyWage is an excellent program for anyone looking to drop a few (or many more) pounds. You are more likely to follow through on your diet and exercise routine when money is involved. You can earn real money and drive weight loss results by signing up for HealthyWage. If you are prepared to make a change, there is no reason to wait! I decided to start my weight loss journey the day after I discovered HealthyWage. The extra incentive and accountability have made losing weight much easier. So, what do you say? Are you prepared to make a change? !